The Jesus and Mary Chain become their own context on their first new album in forever. Jim Reid is absolutely right to assert that to make a good record like Damage and Joy “in your 50s, the way we are... is a minor miracle". In another era not all that long ago, the Jesus and Mary Chain could have easily become a casino act by this point, or they might be off ‘discovering’ ragtime or some other antiquated musical form. Be grateful. From the start, the Jesus and Mary Chain required a bit of context to appreciate what was going on fully. If you didn’t understand the appeal of girl groups from the ‘60s, Phil Spector, and noise rock, you would never understand Psychocandy. 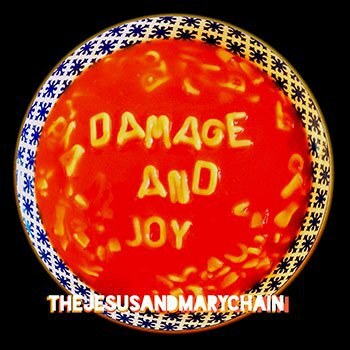 With Damage and Joy, the Jesus and Mary Chain have themselves become the context. The album is as much a kind of career retrospective and odds-and-ends collection as it is a new creative document. Not content to merely watch as new generations came into contact with what they left behind, Jim and William Reid first reclaimed a bit of control by reuniting to play Coachella in 2007. A decade prior, the band was being chipped away at by fallings-out not only among themselves but also with fickle critics and shifting fan bases. Only after their inevitable implosion and the release of their posthumous 21 Singles collection did Lost in Translation come along to usher in their validation with an ‘00s audience waking up to its twee sensibilities -- into which, as a Scottish band forged in the ‘80s, the Jesus and Mary Chain slotted naturally. The nod of bringing Scarlett Johansson up on stage to sing “Just Like Honey” was a big wink but there was also something genuinely appreciative in it. If the Reid brothers don’t seem like the kind to fully forgive and forget, Damage and Joy supports that notion. The opening salvo, “Amputation”, bluntly recalls how Jim Reid felt stoned and dethroned as his legacy drifted away from the public eye when JAMC first broke up: “It’s just like a grape in a bottle / It’s wine today but piss tomorrow.” “Amputation” is a faster, noisier, more mechanized version of “Dead End Kids”, a song Reid initially released solo in 2006. It is the first of a number of tracks on the album that previously saw the light in some other form, including “The Two of Us”, “Song for a Secret”, and “Can’t Stop the Rock”, the three of which were first recorded with Sister Vanilla, the musical alias of sister Linda Reid. Also refurbished (with a dropped ‘must’) is “All Things Pass”, which first surfaced on a television show soundtrack and subsequently wound up on the band’s 2010 hits compilation, Upside Down. When not reclaiming these stray tunes, Damage and Joy raids their own cabinets. Though in an interview with the Observer, Jim Reid attributes the album’s sonic self-reflection to its producer, Youth (of Killing Joke), he acknowledges that “[m]ost of the periods of the band are represented here in some shape or form.” Give Youth his credit, but the similarities can run deeper than production values. “Always Sad” doesn’t just evoke “Sometimes Always” with its male-female duet structure, it turns the latter’s vocal line into a guitar riff. Bernadette Denning’s turn on “Always Sad” is one of a handful of female guest vocal performances on the album, including Linda Reid returning the family favor. Where Hope Sandoval once stood, we now have fair pop muses from subsequent generations: Isobel Campbell (“The Two of Us” and “Song for a Secret”) and Sky Ferreira (“Black and Blues”). What could be seen as a crutch is really one of the album’s strengths, as the band’s melodies have always been influenced by classic pop songs built for multiple voices. Damage and Joy’s other key attribute is the band’s foundational irreverence. The Reid brothers haven’t moved from the lawn chairs in which they stare coolly out at a radiated cultural landscape where no cow is sacred: not JFK (still), not Kurt Cobain, not America itself. They aren’t averse to taking aim at themselves, either. “You know there’s no safety net / You know this is all we get / You know I can’t take no more," goes “Facing Up to the Facts”, which, including its candid confession about JAMC’s notorious brotherly feuding, seems like an explanation for what it’s like to keep on rockin’ in the digital age where a comfortable retirement is nowhere in sight. The solution? “Don’t worry / Be happy.” Hey, it’s worked for everyone from Bobby McFerrin to TV on the Radio -- why not them, too? Ranging from simple rhymes and harmless clichés to rebel teenage snideness to some fairly poignant points, the lyric sheet may not be Damage and Joy’s biggest selling point but rarely do the words get in the way of a good tune. Encapsulating each phase from their storied debut to the softer side they showed in the ‘90s, and even managing to expand a bit with standouts like “War on Peace” and “Los Feliz (Blues and Greens)”, Damage and Joy is a keen reminder of what the Jesus and Mary Chain naturally possess that too many newer bands lack: a strong and inimitable personality, one that cannot be separated from their music and how it works, and one that is still largely intact.